After successfully germinated your seeds, it’s time to take care of them! Controlling humidity, temperature, pH, while feeding your plants, (without giving too many nutrients), are crucial steps at this stage. 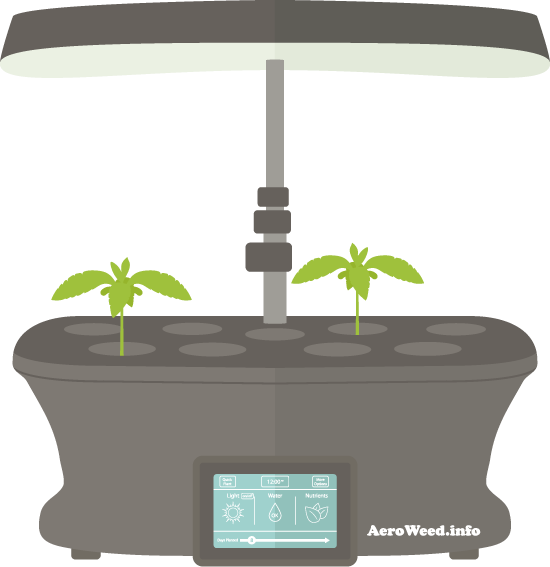 On this page, you will learn all you need to know to grow medical marijuana in your AeroGarden™ during the vegetative stage! In my AeroGarden grow room (or grow tent), I keep the temperature between 22-25 °C (71 – 77 °F). The LED panel does not heat that much, and when lights are off, the temperature should not drop more than one or two degrees. In the night period, don’t let the temperature fall below 18°C (64 °F). In the vegetation period, humidity level should be between 40% – 65%. Higher relative humidity level can lead to fungus problems while lower humidity can lead to smaller plants and lower yields. I monitor the environment in my grow room with a humidity monitor with temperature. When the relative humidity is lower than recommended, you can mist plants with plain water. The light cycle corresponds to the period of light and darkness during a day. Depending on the stage (vegetative or flowering) and the type of your seeds (auto or feminized), the recommended settings are different. In the vegetative stage, you should run on an 18/6 light cycle. After 3 to 4 weeks, when the plant has enough nodes (5 +), you switch to 12/12 to initiate the flowering stage. With feminized seeds, you should cover the control panel to avoid any light leak on the night period during the transition. This may delay the flowering process, so make sure there are no light leaks during the 12 hours of darkness. With autoflowering seeds, you should run on a 20/4 light cycle all the time. 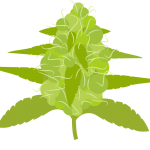 The marijuana plant will switch from vegetative to the flowering stage without a change in the light cycle. Once a week, I use a siphon to remove the water, and I replace the solution with a new mix of nutrients. It is pretty straightforward, and the pH tends to be more stable with fresh water and nutrients. With the following methods, you can increase yields and keep your plant size down. There are many other growing techniques, but I resume below only the most useful and efficient techniques to grow cannabis in the AeroGarden™. This technique is handy to control the height of your plants. You cut the main stem to force the plant to split into two stems. I usually cut above the third node and later, I cut the secondary branches as well to get a flat canopy and better control of the global shape. Topping help to multiply buds sites and improve light dispersion. Important: I don’t recommend topping technique with auto-flowering plants. Because auto-flower start flowering very early, they have less time to recover from this stress. LST is simply bending the stems down to get a wider plant and better light dispersion. Low-stress training is perfect for auto-flowering plants. I bend the stem with twist ties, and I fix them to AeroGarden’s plastic trellis bracket (included in the box).